Finally launched and available in the iOS App Store! 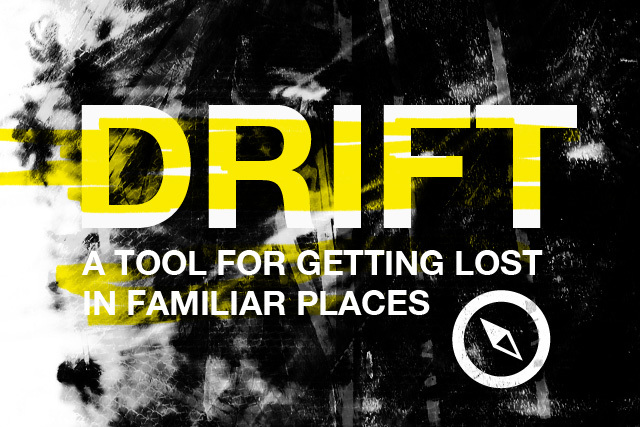 Drift helps you get lost in familiar places by guiding you on a walk using randomly assembled instructions. Each instruction will ask you to move in a specific direction and, using the compass, look for something normally hidden or unnoticed in our everyday experiences. As you find these hidden or unnoticed things, you will be asked to document them with the camera, creating a photographic record of you walk. Drift also keeps track of where and when you took the photos and makes your documentation optionally available for others to view through the Drift website. Drift was made possible with the generous support from the Ontario Arts Council Media Arts Grant for Emerging Artists. Drift was developed by Justin Langlois in collaboration with Broken City Lab. This project was generously supported by the Ontario Arts Council Media Arts Grant for Emerging Artists. Please contact us with any questions, concerns, or issues you have with Drift and we’ll get back to you as soon as possible. Pingback: Breitband - Smart Cities – vernetzt, effizient, überwacht ?